If you consider Cascadian black metal as a genre classifier, and the media at large does consider it quite often, an emotive, nature driven, crust laden strain of melodic dissonance comes to mind that borrows from decades of European/Scandinavian blackness, injecting it’s own unique influence on the final product. 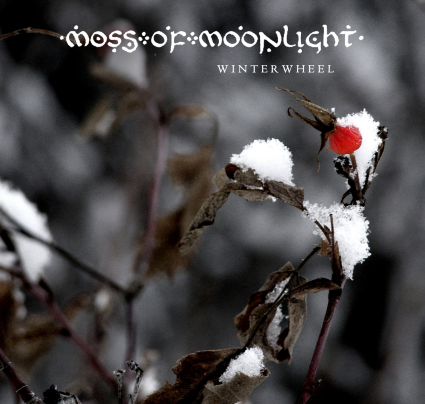 Enter Moss of Moonlight… touting their pride for Cascadian lands through their own conceptual journey that considers their geographical location as an independent country, and affinity for an at times very celtic spin on their overall sound. Ok… something different to sing about I suppose to further glorify their surroundings, but this husband and wife duo’s union of black metal characteristics, folk embellishments by way of traditional instrumentation, and a very “pro” production unveils a level of pretentiousness that rides through Winterwheel. Harsh vocals are the main and most palatable focus for the bulk of this material, but when the clean male and female singing comes in, it strikes me as underdeveloped and awkward. It further paints a light-hearted mental image created by the music in which Moss of Moonlight further empowers with flutes and other traditional twists in the compositions. Sometimes it works and I must applaud the band for spinning just outside their comfort zone, striving to mature their overall style. Those who succeed in attempting this just have “it” and pull it off as an effortless extension of their creative spark. MoM’s efforts sound forced to me. Granted, folk elements in black metal tend to sound “off” to my ear, unless a band is really on their game. I prefer a warm atmosphere over hokey melodies and he said-she said roll-play in the lyrical/vocal department. Having said that, the stylistically black metal touched elements in this projects sound are by far the most comfortable for them, with lengthy tracks like Gaet being quite an undertaking with a lot of riffs to be heard and painstaking song structure. As the solo for this song fumbles through some sour notes which act as nails on the chalk board, I’m once again reminded of a band trying so hard to reach a level they’re just not at yet and it is moments like this that stick with me and add up as Winterwheel progresses. As this album ends with the somber non metal track, Hraefne, we are finally treated to a 6 minute journey that I found interesting and quite passionate. Minimal. Primitive. Voices are the foundation and a subtle synth line carries them along. The male and female vocals gel perfectly on this and the band finally nail a level of folk-based music that engages and achieves an otherworldly plateau. I guess it’s where this style intertwines with a metal canvas when they lose me, but this could be a colorful glimpse into what’s to come for Moss of Moonlight. ~ by martyworm on July 17, 2013. This entry was posted on July 17, 2013 at 7:28 pm and is filed under ALL REVIEWS, M-reviews.You can follow any responses to this entry through the RSS 2.0 feed.You can leave a response, or trackback from your own site.